What a great way to start your Saturday morning! The JG Group will supply the garbage bags and tongs needed to pick up debris on the streets that need sprucing up. After the sweep, the hot dogs are on us! 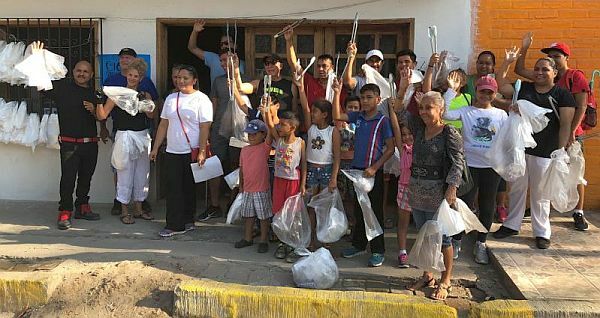 Puerto Vallarta, Mexico - The JG Group's Colonia Clean-ups continue through the summer to keep raising awareness and getting residents and visitors alike involved in keeping our colonia clean. If you are in Vallarta the first Saturday of the month, join us on August 4 and share the love. What a great way to start your Saturday morning! The JG Group will supply the garbage bags and tongs needed to pick up debris and assign streets that need a little sprucing up. After the sweep, the hot dogs are on us! Please RSVP to alejandra(at)jggrouppv.com if we can count on you Saturday morning, then meet us in front of our offices at Lazaro Cardenas 421 by 9:30 am. We'll finish working by 11:30 am, but be sure to stick around for hot dogs, with all the fixings and cool refreshments afterwards. If you cannot participate but would like to contribute to this community effort, you can donate $100 pesos so we can hire some of the neighborhood kids to help with the clean-up. Please swing by our offices anytime between 9 am and 6 pm during the week and we'll be happy to take your pesos. We love our Bay, so timing is critical. Now that the summer rains are getting heavier, we can do our part to minimize the garbage that floats down into the ocean. Join us! The JG Group's office is located at Lazaro Cardenas #421 between Calles Aguacate and Jacarandas in Colonia Emiliano Zapata. Tel: 322-688-2146 Website: jggrouppv.com.